The long-time leader of the Iowa-based World Food Prize has announced he’ll retire in January. Kenneth Quinn, a former U.S. Ambassador to Cambodia and an aide to former Iowa Governor Robert Ray, has been president of the World Food Prize since 2000. This is the second time the 76-year-old Quinn has retired. 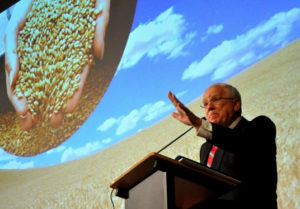 After a 32-year career as a U.S diplomat, Quinn has worked to establish international recognition of the World Food Prize. It’s an annual, 250-thousand dollar award that recognizes someone whose life work has improved the quality, quantity or availability of food. Quinn announced his planned retirement on what would have been Norman Borlaug’s 105th birthday. Borlaug is the Iowa native and Nobel laureate who pushed for creation of the World Food Prize. Quinn was born in New York City, went to high school in Dubuque and graduated from Loras College. The World Food Prize Foundation is launching a search to find a successor to Quinn.